UTJ Knesset faction head Rav Yisrael Eichler plants a tree in worm-free vegetable greenhouse, a day after a tour by Rav Lior. The Chairman of the United Torah Judaism faction in the Knesset, MK Rav Yisrael Eichler, planted a tree Wednesday in the greenhouses where Gush Katif evictees grow worm-free vegetables. Eichler's visit was meant to give encouragement to the agriculturalists, who hail from the Nitzanim area. Their original farms, in the communities of Gadid and Ganei Tal, were destroyed in the pullout from Gush Katif in 2005. One day earlier, on Tuesday, the Chief Rabbi of Kiryat Arba, Rav Dov Lior, visited the Nitzanim communities. He delivered lectures in local synagogues and yeshivas and was impressed by the new agricultural endeavors. 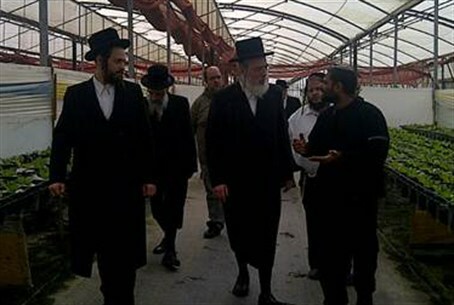 The rabbi visited greenhouses producing export vegetables miraculously grown where nothing had ever grown in the past. He encouraged yeshiva students to excel at their studies, and made the blessing for seeing a new Jewish settlement, ‘Matziv Gevul Almanah’ ('Blessed be He who Reinstates the Boundary of the Widow'. Israel is allegorically a widow returning to her home, ed. ).